Among the wisdom teachings of Vajrayana Buddhism are many reminders to not be fooled by appearance. What can seem frightening and even monstrous is not necessarily evil, but can be there for our benefit. Nothing illustrates this principle better than dakinis. A dakini is a manifestation of liberating energy in female form. Sometimes they are beautiful, and sometimes they are wrathful and hideous and decorated with skulls. Because they represent liberation they often are depicted naked and dancing. The Tibetan word for dakini is khandroma, which means "sky goer." In Buddhist tantra, iconic dakinis help arouse blissful energy in a practitioner, transforming defiled mental states, or klesas, into enlightened awareness. In Vajrayana iconography prajna, wisdom is often depicted as the female principle to be joined with upaya, or skillful means, the masculine principle. Thus the liberation of the female dakini is the boundlessness of sunyata, emptiness, which is the perfection of wisdom. Veneration of dakinis appears to have first emerged in India sometime between the 10th and 12th centuries. The original dakinis may have been the female consorts shown in yab-yum images. About the same time, dakinis also appeared in Hindu art and stories, originally as evil and malevolent spirits. But it was within Buddhist tantra that dakinis developed into richly complex archetypes of liberating power. The dakini tradition was transmitted from India to Tibet, and today dakinis are most closely associated with Tibetan Buddhism. Dakinis also are found in Japanese Shingon Buddhism, where they came to be associated with foxes. In Japanese folklore, foxes have many magical properties and can take the form of human women. Dakinis may be enlightened or unenlightened. An unenlightened dakini is sometimes called a "worldly" dakini. A worldly dakini is still caught in the cycle of samsara and may manifest as a kind of trickster. But most of the time when we're talking about dakinis, we're talking about enlightened ones, also called "wisdom" dakinis. Dakinis play many different roles in Vajrayana and can be identified in many ways, but often they are sorted into four major classes. These four are secret, inner, outer, and outer-outer. On the secret level, the dakini is a manifestation of the most subtle state of mind experienced intimately in highest tantra yoga. At the inner level, she is a meditation deity or yidam, an expression of the most basic nature of the practitioner. The outer dakini manifests as a physical body, which may be the physical body of the practitioner who has realized himself as her, as self-other dualities melt away. And the outer dakini is a dakini in human form, possibly a teacher or yogini. Dakinis also are classified according to the five Buddha families, illustrated by the Five Dhyani Buddhas. And they are sometimes associated with the three aspects of the Trikaya. However, sorting iconic dakinis into rigid classifications is to miss them. More than anything else dakinis represent dynamism and energy. They are the power that brings about transformation. They can manifest in many forms, including as yourself. They are fierce, and often frightening, and don't conform to expectations. In Western art, traditionally benevolent beings are depicted as beautiful and malevolent ones are ugly, but the art of Asia doesn't always follow that pattern. The many wrathful characters depicted in Buddhist art, including wrathful deities, often are protectors and teachers. Their appearance is a manifestation of power and even ferocity, but not malevolence. The symbolism associated with wrathful beings may also confuse the uninitiated viewer. For example, when a dakini is shown dancing on a corpse, the corpse does not represent death but rather an ignorance and the ego. Many iconic figures can appear in both peaceful and wrathful aspects. For example, the usually beautiful Tara, an archetype of compassion, sometimes manifests as Black Tara, who can resemble the black, dancing dakini in the image above. Black Tara functions to ward off evil, not cause it. 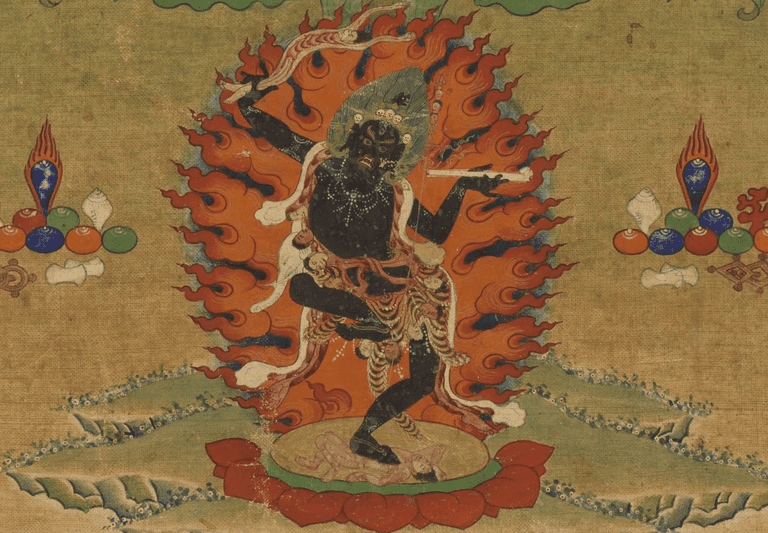 In their wrathful appearance dakinis are akin to Dharmapalas, who in Tibetan mythology often were former demons who converted to Buddhism and became dharma protectors. The Dharmapala Mahakala is the wrathful form of Avalokiteshvara, Bodhisattva of Compassion. The one principal Dharmapala who is female, Palden Lhamo, is often also called a dakini. The dakini Vajrayogini, who can manifest as several other beings, is one of the earliest dakinis and is considered to be the supreme deity of all tantric gods and goddesses. Narodakini is a particularly fierce dakini of early Vajrayana. Simhamukha is a lion-headed dakini and female manifestation of Padmasambhava.